(Nanowerk News) On 26 July 2012, the H.E.S.S. 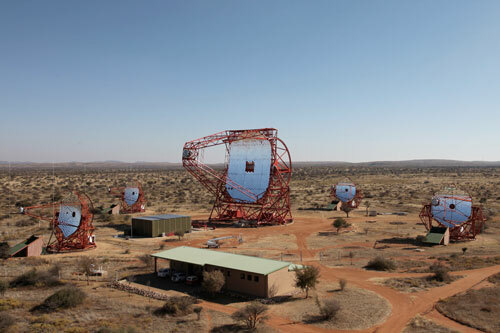 II telescope started operation in Namibia. Dedicated to observing the most violent and extreme phenomena of the Universe in very high energy gamma-rays, H.E.S.S. II is the largest Cherenkov telescope ever built, with its 28-meter-sized mirror. Together with the four smaller (12 meter) telescopes already in operation since 2004, the H.E.S.S. (“High Energy Stereoscopic System”) observatory will continue to define the forefront of ground-based gamma ray astronomy and will allow deeper understanding of known high-energy cosmic sources such as supermassive black holes, pulsars and supernovae, and the search for new classes of high-energy cosmic sources. With a mass of almost 600 tons and its 28-meter mirror - the area of two tennis courts – the new arrival is just huge. This very large telescope named H.E.S.S. II saw its first light at 0:43 a.m. (German time zone) on 26 July 2012, detecting its very first images of atmospheric particle cascades generated by cosmic gamma rays and by cosmic rays, marking the next big step in exploring the Southern sky at gamma-ray energies. “The new telescope not only provides the largest mirror area among instruments of this type worldwide, but also resolves the cascade images at unprecedented detail, with four times more pixels per sky area compared to the smaller telescopes” states Pascal Vincent from the French team responsible for the photo sensor package at the focus of the mirror. New gamma-eye for the H.E.S.S family: The telescope has a antenna with a diameter of 28 meters and weighs over 6000 tons. Gamma rays are believed to be produced by natural cosmic particle accelerators such as supermassive black holes, supernovae, pulsars, binary stars, and maybe even relics of the Big Bang. The universe is filled with these natural cosmic accelerators, impelling charged particles such as electrons and ions to energies far beyond what the particle accelerators built by mankind can reach. As high-energy gamma rays are secondary products of these cosmic acceleration processes, gamma ray telescopes allow us to study these high-energy sources. Today, well over one hundred cosmic sources of very high-energy gamma rays are known. With H.E.S.S. II, processes in these objects can be investigated in superior detail, also anticipating many new sources, as well as new classes of sources. In particular, H.E.S.S. II will explore the gamma ray sky at energies in the range of tens of Giga-electronvolts – the poorly-explored transition regime between space-based instruments and current ground-based telescopes, with a huge discovery potential. The most extreme gamma ray emitters – Active Galactic Nuclei – shine in gamma rays with an apparent energy output which is one hundred times the luminosity of the entire Milky Way, yet the radiation seems to emerge from a volume much smaller than that of our Solar System, and turns on and off in a matter of minutes, a strong signature of supermassive black holes. For some of the objects seen with the four H.E.S.S. telescopes in the last years, no counterpart at other wavelengths is known; they may represent a new type of celestial object that H.E.S.S. II will help to characterize. When gamma rays interact high up in the atmosphere, they generate a cascade of secondary particles that can be imaged by the telescopes on the ground and recorded in their ultra-fast photo sensor 'cameras', thanks to the emission known as Cherenkov radiation – a faint flash of blue light. The high-tech camera of H.E.S.S. II is able to record this very faint flash with an “exposure time” of a few billionths of a second, almost a million times faster than a normal camera. The H.E.S.S. II camera – with an area of the size of a garage door and a weight of almost 3 tons – is “flying” 36 meters above the primary mirror in the focal plane – at the height of a 20-story building when pointing up. Despite its size, the new telescope will be able to slew twice as fast as the smaller telescopes to immediately respond to fast and transient phenomena such as gamma ray bursts anywhere in the sky. Images of particle cascades viewed simultaneously by the H.E.S.S. II telescope and by the H.E.S.S. I telescopes. Color encodes light intensity. The image illustrates the dramatically improved intensity and resolution with which H.E.S.S. II views the particle cascades. The H.E.S.S. I cameras are shown in reduced size. The telescope structure and its drive system were designed by engineers in Germany and South Africa, and produced in Namibia and Germany. The 875 hexagonal mirror facets which make up the huge reflector were manufactured in Armenia, and individually characterized in Germany. The mirror alignment system results from a cooperation of German and Polish institutes. The camera, with its integrated electronics, was designed and built in France. The construction of the new H.E.S.S. II telescope was driven and financed largely by German and French institutions, with significant contributions from Austria, Poland, South Africa and Sweden. “The successful commissioning of the new H.E.S.S. II telescope represents a big step forward for the scientists of H.E.S.S., for the astronomical community as a whole, and for Southern Africa as a prime location for this field of astronomy” - so Werner Hofmann, spokesperson of the project – “H.E.S.S. II also paves the way to the realization of CTA – the Cherenkov Telescope Array— the next generation instrument ranked top priority by astroparticle physicists and funding agencies in Europe”.